Tampa Bay Demands, “Hands Off Syria! Hands Off North Korea!” | Fight Back! 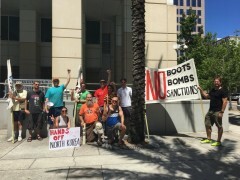 Tampa, FL - Fifteen activists and community members from Tampa Bay gathered on May 27 to demand U.S. hands off Syria and north Korea. The protest, organized by Tampa Anti-War Committee and Saint Pete for Peace, started at the Sam Gibbons Federal Courthouse and included a march to Curtis Hixon Park in Downtown Tampa. The event was called in response to President Trump’s attacks on Syria and his push for more action against the Democratic People’s Republic of Korea (DPRK). In April, Trump launched 59 cruise missiles at the al-Sharyat air base in Syria, killing 15 people. He has also announced plans for a missile defense test and increased sanctions on the DPRK. Both of these actions are part of ongoing campaigns to destabilize any country seen as a threat against U.S. imperialism, and for ‘regime change’ in both countries. Bill Aiman of the Tampa Anti-War Committee talked about how “promoting democracy” is used by the U.S. as an excuse to destabilize regions. Aiman pointed out the hypocrisy of criticizing Syrian President Bashar Al-Assad for alleged human rights abuses, while partnering with Saudi Arabia, a monarchy. “This should not come as a shock to us, however, as historically this country has opposed Arab republics that are against U.S. interests,” said Aiman. Much like Syria, the DPRK has been attacked by the U.S. media and politicians, for supposedly posing a threat to the U.S. with its nuclear development. “We know that the behavior of the U.S. towards north Korea has been nothing short of antagonistic and American imperialist history is responsible for the division of Korea,” said Dina Formentini of Saint Pete for Peace. Chrisley Caprio of Tampa Bay Students for a Democratic Society stated that the U.S. uses racist stereotypes to promote the idea that the DPRK is ‘violent’ and ‘irrational’ to justify its actions against the DPRK. “They do all of this to disguise the fact the U.S. leveled Korea and used chemical and biological weapons on the country during the Korean war, in their effort to prevent socialism there. The only reason they cannot try this again is, interestingly enough, north Korea's missile defense program and possession of nuclear weapons,” said Carpio. Gage Lacharite of the Freedom Road Socialist Organization dispelled myths about the DPRK’s nuclear development. “For the Korean people, nuclear power is freedom. Freedom from external attack, freedom to reunify into one Korean republic, freedom to rebuild after over 70 years of U.S. military occupation on the peninsula,” Lacharite said. To fight back against U.S. aggression, it is important to build the anti-war movement. For upcoming meetings and events, follow Tampa Anti-War Committee and Saint Pete for Peace on Facebook.